David Warner had been a brute force in this season of the IPL until Monday (April 8) night. His batting strike rate was an astounding 158.52 and he had made two half-centuries and a century in five matches. On Monday, Warner was tasked with an entirely different responsibility on a different wicket at Mohali against Kings XI Punjab. After Bairstow departed early, the onus was on Warner to up the ante and take the attack to the opposition. Instead, he took his time realising that the Sunrisers Hyderabad middle-order wasn't the strongest. In the powerplay overs, Warner faced 17 balls and made just nine runs with just the one boundary. This is an anomaly to his usually belligerent starts. In overs 0-6 in IPL, Warner strikes at a rate of 139.02 and scores a boundary roughly every fourth ball. On Monday, his strike rate was a questionable 52.94 but the situation demanded him to bat differently. The ball was swinging and seaming off the deck early on and Warner had to counter that while ensuring he kept wickets intact. In his first 30 balls, Warner made just 20 runs as Sunrisers appeared to be in no hurry to push the scoring rate. Just 50 runs had come in the first 10 overs but Warner knew as long as he was out there, the run rate was bound to improve. His half-century came up off 49 balls, his slowest in the IPL. His second slowest fifty also came against Kings XI Punjab in 2017 (off 47 balls). Interestingly, this is his seventh successive half-century against Kings XI, a record that stretches back to the 2015 season. Incredibly, Warner had also made seven successive half-centuries against RCB between 2014 and 2016. 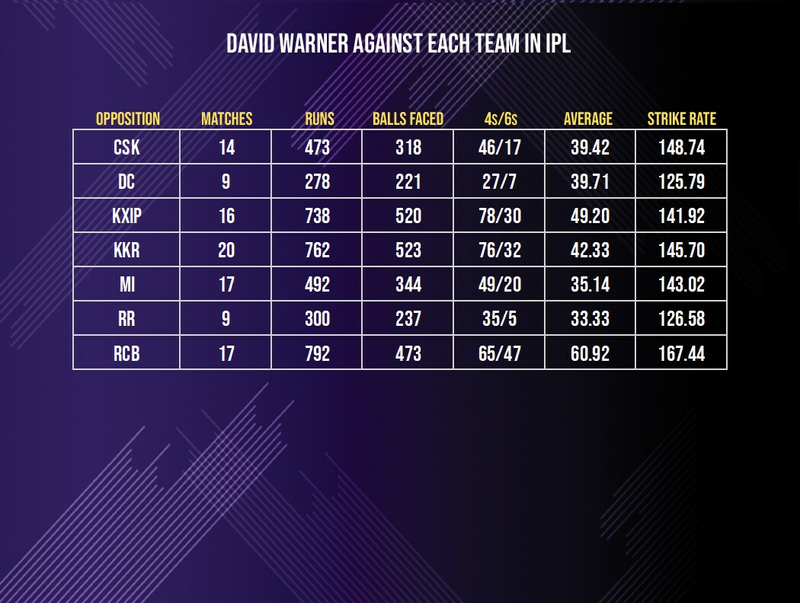 Warner has a terrific record against Kings XI Punjab in the IPL, making 738 runs at an average of 49.20. This is his second best average against any franchise and his third highest tally of runs against an opponent after Royal Challengers Bangalore and Kolkata Knight Riders. Once he was set at the crease on Monday, Warner was ready to take on the attack. If his strike rate was a confounding 66.66 off the first 30 balls, it soared to 156.25 from there as he ended unbeaten on 70. In between overs 6-16, Warner made 42 runs at a strike rate of 131.25. It was still below his usual strike rate in this phase of a T20 innings - 141.27 - but Warner was expected to soon up the ante. In the death (16-20), Warner made just 19 in 13 balls and wasn't able to get Sunrisers to a total they would have liked. His strike rate of 146.1 in the death paled in comparison to his career strike rate of 196.8 in this phase of the innings. While he anchored the innings much like Steven Smith did for Rajasthan against Kolkata the other night, Warner perhaps played a tad too conservative and cost Sunrisers a few runs. Eventually, he was unbeaten on 70 off 62 balls and Sunrisers reached 150, a total they failed to defend.